W ith affordable sites that are ripe for commercial development, central location with fantastic interstate access, affordable transportation costs, well-maintained infrastructure and an educated, affluent workforce, O'Fallon, Missouri, offers practical, competitive real estate and development opportunities. Home to over 1,800 businesses and more than 87,000 residents, O'Fallon is the second-largest city in metropolitan St. Louis and is St. Charles County's largest municipality. O'Fallon's shopping and dining attractions include more than 160 restaurants and 375 stores, including national names, successful family-owned businesses, and a diverse selection of restaurants and specialty shops. Economically, the City's overall picture is bright. 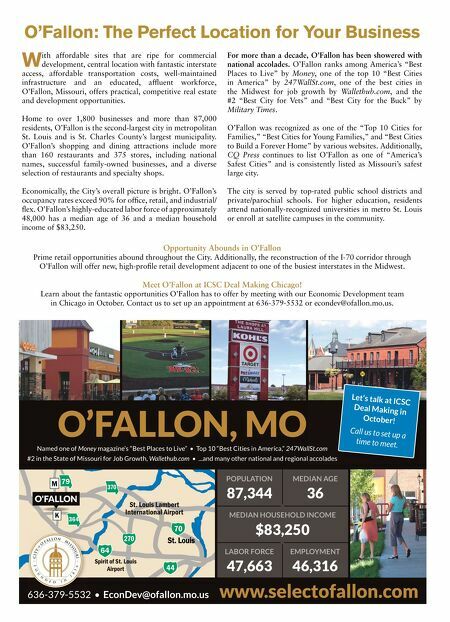 O'Fallon's occupancy rates exceed 90% for office, retail, and industrial/ flex. O'Fallon's highly-educated labor force of approximately 48,000 has a median age of 36 and a median household income of $83,250. For more than a decade, O'Fallon has been showered with national accolades. O'Fallon ranks among America's "Best Places to Live" by Money, one of the top 10 "Best Cities in America" by 247WallSt.com, one of the best cities in the Midwest for job growth by Wallethub.com, and the #2 "Best City for Vets" and "Best City for the Buck" by Military Times. O'Fallon was recognized as one of the "Top 10 Cities for Families," "Best Cities for Young Families," and "Best Cities to Build a Forever Home" by various websites. Additionally, CQ Press continues to list O'Fallon as one of "America's Safest Cities" and is consistently listed as Missouri's safest large city. The city is served by top-rated public school districts and private/parochial schools. For higher education, residents attend nationally-recognized universities in metro St. Louis or enroll at satellite campuses in the community. POPULATION MEDIAN AGE 87,344 36 MEDIAN HOUSEHOLD INCOME $83,250 LABOR FORCE EMPLOYMENT 47,663 46,316 364 70 44 St. Louis Lambert International Airport Spirit of St. Louis Airport O'FALLON, MO Named one of Money magazine's "Best Places to Live" • Top 10 "Best Cities in America," 247WallSt.com #2 in the State of Missouri for Job Growth, Wallethub.com • ...and many other national and regional accolades www.selectofallon.com 636-379-5532 • EconDev@ofallon.mo.us Let's talk at ICSC Deal Making in October! Call us to set up a time to meet. O'Fallon: The Perfect Location for Your Business Opportunity Abounds in O'Fallon Prime retail opportunities abound throughout the City. Additionally, the reconstruction of the I-70 corridor through O'Fallon will offer new, high-profile retail development adjacent to one of the busiest interstates in the Midwest. 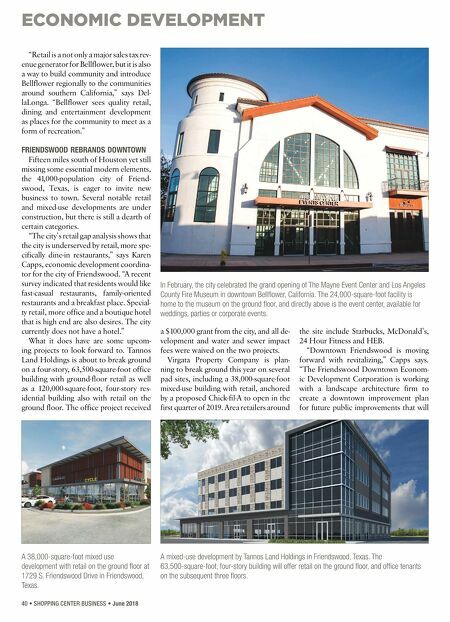 Meet O'Fallon at ICSC Deal Making Chicago! Learn about the fantastic opportunities O'Fallon has to offer by meeting with our Economic Development team in Chicago in October. Contact us to set up an appointment at 636-379-5532 or econdev@ofallon.mo.us.